The sights, the sounds, the colors, the people, the spirit, the joy, but most of all the PRIDE! 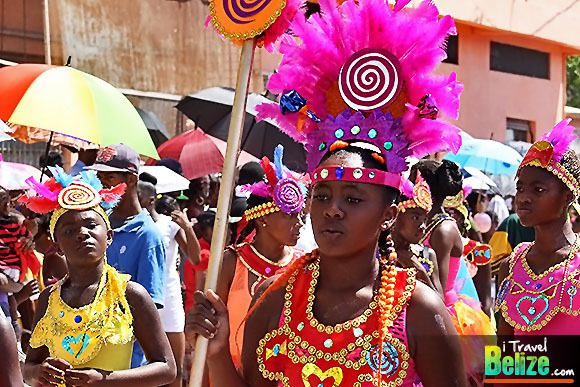 Witnessing the Belize Carnival Parade, that takes place during the country’s September Celebrations honoring Independence Day, is nothing short of spectacular. 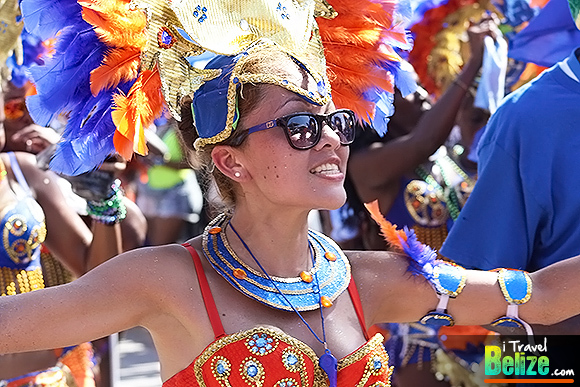 Immerse yourself into the celebrations and you will get to experience first hand why Belizeans are considered such a happy and celebratory people. Boys and girls as young as six years old are decked out in full costume to the theme of their mas band camp and their energies are as, if not stronger, than those of the adults who swing, twerk and gyrate their bodies to the high-energy sounds of “Jump Up” music, as they call it in Belize. The route is a lengthy one (about four hours long) that takes place during one of the hottest months of the year, but that does not keep the parade participants from suiting up (or down to the bare essentials in some cases). Spectators also set up chairs and umbrellas along the parade route, picking their favorite location to witness all the fun and excitement. Those who are lucky to live along the parade route, gather friends and families and parties erupt along neighborhoods. Stores and street vendors take advantage of the massive crowds that arrive from every corner of the country to sell food and refreshments. It’s one giant celebration all along the parade route. 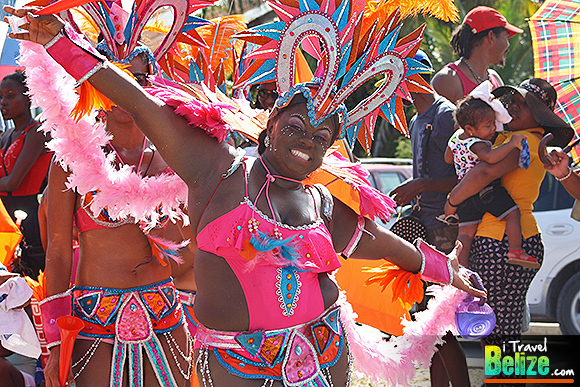 The Belize City Carnival is clearly influenced by carnival in the Caribbean with an engaging experience of music, dance and costumes galore, but it has evolved into its own unique event. For one, patriotism is evident in every costume, float and participant showing strong love for Belize. 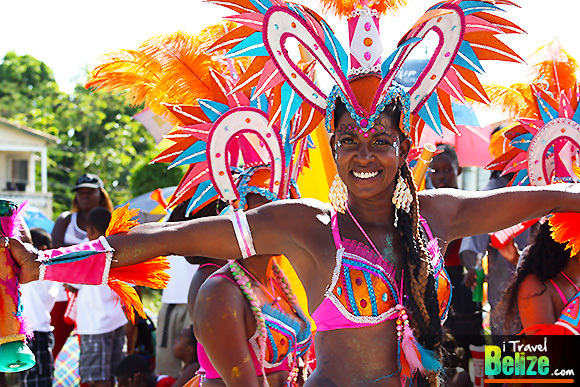 That is what drives the Carnival – the passion and pride to celebrate a love for the country. These groups spend countless hours fundraising throughout the year in order to create these elaborate costumes; business sponsorships help a lot. On parade day the participants are more than eager to show off all their hard work. 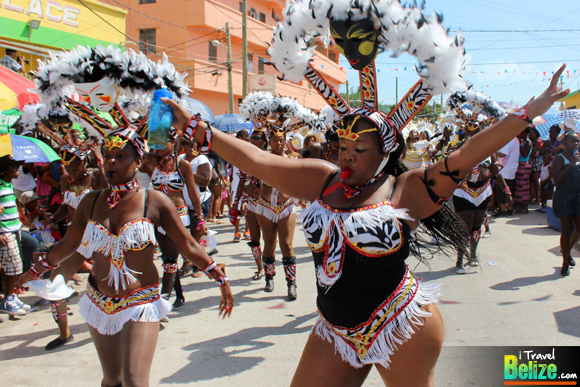 Carnival in Belize is LOUD, COLORFUL and FUN, there is no doubt about it. Whether you are participant in the parade or a spectator on the side, it is a joy to experience all the vibrantly decorated trucks equipped with generators and towering speaker boxes that reach for the sky. 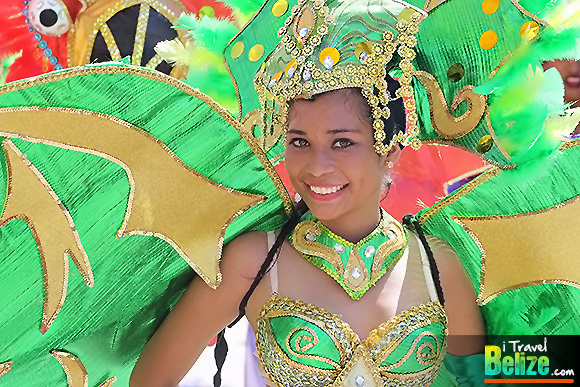 But it is the beautiful people of Belize who make the parade the most colorful. Belize showcases its rich ethnic diversity and cultural uniqueness with a bang! 1. The most important tip is to keep cool. With temperatures usually in the high 90’s during the month of September it is very important to wear sunscreen, keep shaded with a cap/hat/umbrella, wear light and breathable clothing, sandals or flip-flops are great but tennis shoes are recommended if you plan to participate in the parade and a portable chair is a plus. 2. Keep Hydrated! – Carry a water bottle with you; it can easily be refilled with water, Gatorade or even a refreshing Belikin Beer. There is no need to worry about snacks, food or refreshments as street vendors set up shop along the parade route selling a variety of items ranging from the local favorite Rice & Beans, Barbeque, hotdogs, nachos, tamales, corn on the cob, water, beer, shaved ice and much more. 3. To capture a more spirited parade experience, try to catch it at the beginning of the route as the participates are more energetic and ‘fresh-looking’ around the start. Usually, by the end of the four-hour long trek most are tired and less spirited. 4. 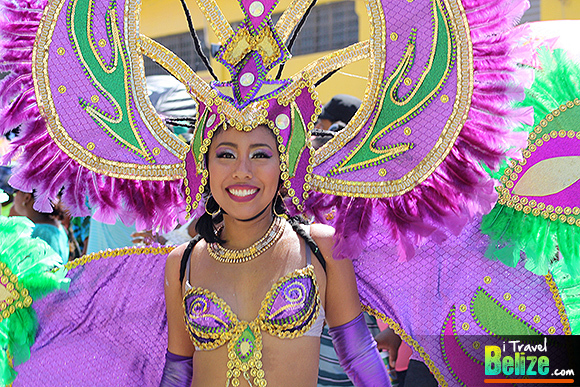 Don’t forget to take along your camera; you will regret not documenting your Belizean Carnival experience. 5. Most of all – HAVE FUN!!! If you are a tourist, tag along with a local group. 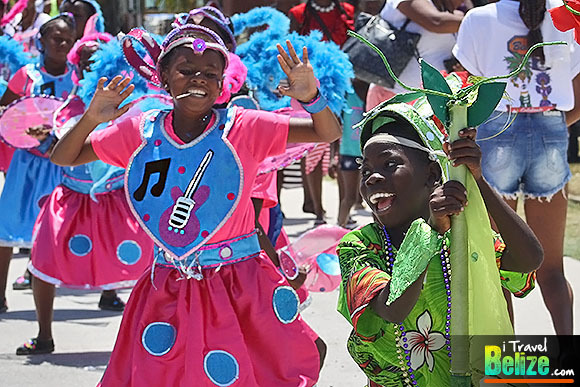 Belizeans are way too friendly not to embrace your spirit of celebrating along with them. If you want, don’t stay in one spot; walk up and down the route to find that perfect ambience that will make your experience more memorable.